These monkeys are ‘Topeng Monyet’ (Dancing Monkeys), stolen from the forest, trained by torture & starvation, teeth ripped out with pliers without anaesthetic, suffer serious infections, made to perform humiliating & health threatening tasks for long, exhausting hours, often whilst nursing infants. The most common form of training is to tie a chain around the monkeys neck and tie it to something. The monkeys arms are tied behind their back and stone is put on the ground. The chain is kept short so that the monkey has to stand on tippy toes or on the stone or they choke. They are kept like this for hours and hours each day to develop their leg muscles so they can walk and stand like a human. 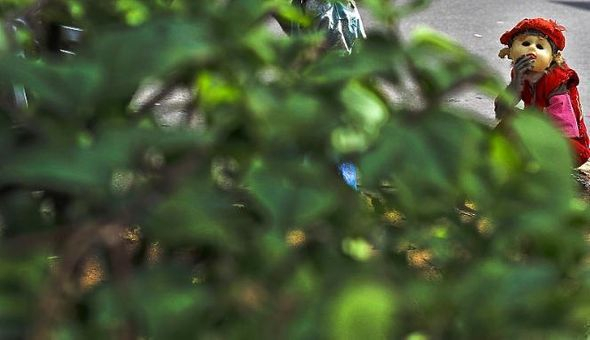 Once trained they are made to perform humiliating tricks to earn money for their owners and the macaque monkeys can be seen kept on short chains, on the street and often in front of the owner’s house in many cities and villages in Indonesia. While growing up to adulthood, the chain often grows into the skin, leading to horrific infections and tetanus. Macaques are highly social creatures and in need of social contact. 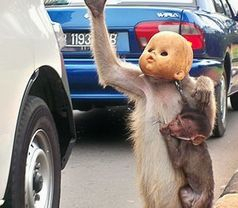 In 2014 a new law was applied in Jakarta to prohibit Topeng Monyet. This means that they are now able to be rescued & confiscated from the people who abuse them. 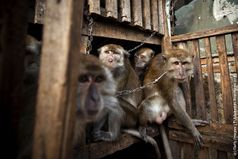 Funds are required to quarantine & socialize these traumatised monkeys in specially built socialization cages & to eventually relocate these monkeys to areas where they can return to the wild to live as normal lives as they can. Once they rehabilitated they are released in areas where they are isolated from humans & can have regular monitoring, medical care & supplemented food if need be. They are sterilised pre-release. Please watch the short videos on the right of the page. 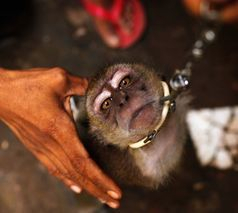 These tortured monkeys can only be rescued, socialized & released if YOU contribute. PLEASE be a part of their emancipation & healing. HOW YOU CAN HELP.